The Corral Basic Fencing Tape offers durable stainless steel conductors which provides an excellent price to performance ratio for short fence lines. Please see below for further information regarding each tape. 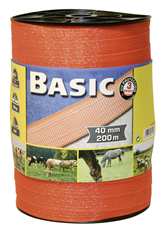 There are currently no questions for Corral Basic Fencing Tape - be the first to ask one!